Good Morning Everyone! I am home after a FABULOUS three days ALONE with my husband. We had such a good time together: Just the TWO of us. My daughter is in Malibu, and my son was at music camp, so we were alone for the first time in twenty two years. We ate out a lot, went to the movies, and just had so much fun being together. We both laughed and joked a lot about the 'empty nest syndrome'. We said 'Whats the problem? This is great!'. Anyway, because I was away most of the weekend, I was unable to work on anything. I never did sew my dress. I just didn't have the time. So I bought one off the rack instead. But I did cut it all out, and would like to finish it before the middle of July when I'll need another sun dress for a festival were attending, so hopefully I'll be able to show it to you soon. So, because I have no new projects to share, I will be showing more garden pictures instead. Today's Featured Flowers are Clematis and Dame's Rocket. Clematis are vines. There are many different colors, and styles of flowers, and different bloom times. The two I'm showing today are early spring bloomers. I also have some Clematis that are mid-summer bloomers. 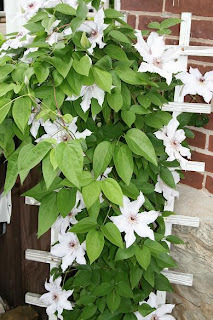 This first picture is of a White Clematis that grows right up on a trellis and onto the railing of my front porch. It is a real show-stopper and is such a beautiful flower to greet all my guests! The second picture is a close up of this beauty. 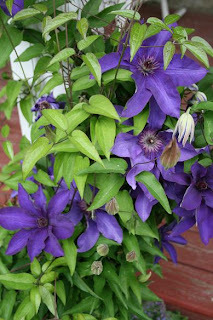 The close up of the purple Clematis is on my back porch. It grows right up the post. I have 4 porches on my house...so there are plenty of posts and railings to grow beautiful vines. 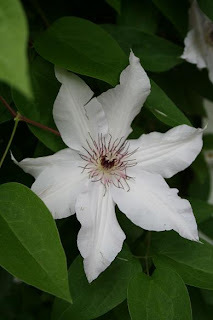 I love Clematis because it is such a low-maintenance plant. I've never had any trouble with them, and they never grow out-of-control like most vine plants do. I have a Trumpet Vine, that although it is very beautiful, it is also such a pain because of its vigorous growth. I need to take a machete and hack away at it several times throughout the growing season--its nuts! And then its constantly sending up suckers in my lawn and garden. I wish I never would have planted that one, but I fear I'm now stuck with it forever! I have a grape vine that also does the same thing. So watch what vines you plant....they tend to get carried away...especially IVY! 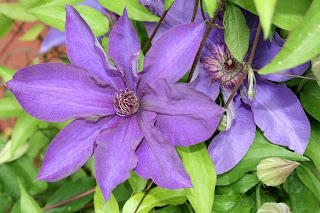 Stick to a Clematis, and you will never regret it! Here is a farther away picture of my purple Clematis. 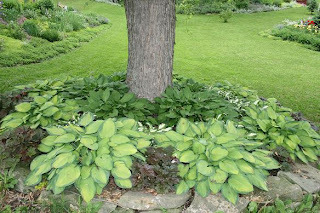 And below is a close up of a ring of Hostas around a maple tree. 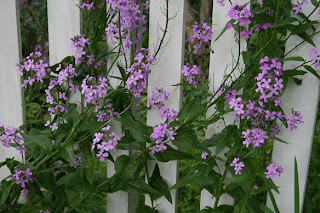 My second featured flower is Dame's Rocket. 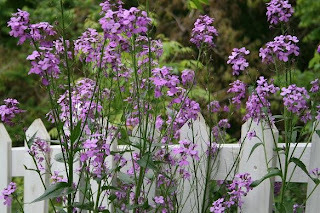 You will find Dame's Rocket growing along the roadside in early spring. I love the beautiful blooms and sweet scent, so I plant it in my garden. Dame's Rocket plants are Biennials: the only live two years, and bloom only once during that time. So you have to let the plants go to seed if you want to see more of them next year. I know its unsightly to leave the spikes up after the flowers fade, but there is no other way. These flowers don't mind shade at all, so I planted them in my wood-line garden along my fence. The purple really pops against the white pickets. 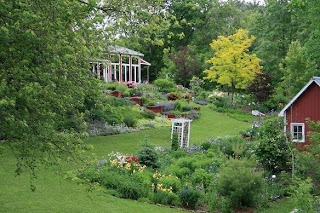 And finally, here is a far away shot of my Late Spring Garden. These pictures were actually taken several week's ago, and so much has changed already. It is now summer already. I can't believe how fast the warm months go...and then the winter months just DRAG! UGH! SO glad you & DH are enjoying each other's company ... isn't it fun to have that 1 on 1 time!! Your flowers are gorgeous as always, and thanks for sharing all the PURPLE with me! LOVE IT!! You mentioned on my blog about how many card I get done & you don't ... well I'm sure your house is cleaner than mine is right now, LOL!! Priorities you know, LOL!! My sister has clematis growing up her deck posts and they are so pretty and showy. I don't have any vertical places to grow vines though. I also like the dame's rocket. I've never seen that before.